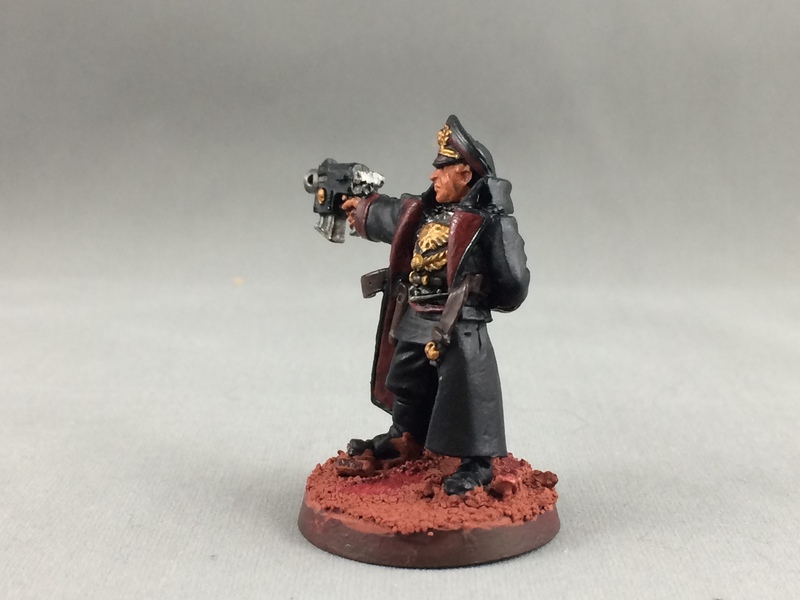 This post I am going to combine three Astra Militarum units into one post. For Inner Circle I am using the Fall of Cadia as my inspiration. The scene I am using is when Trazyn releases his collection from the Imperium to aid in the battle against Abaddon and the Black Legion. The story references Vostroyans being released into the fray. Conveniently I have Vostroyans in my collection. 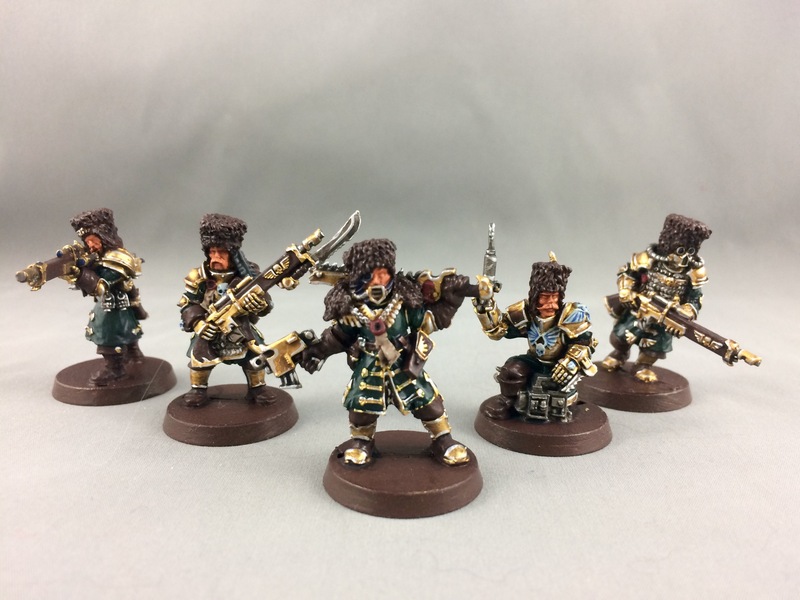 I bought Vostroyans years ago to compliment my Sisters army. 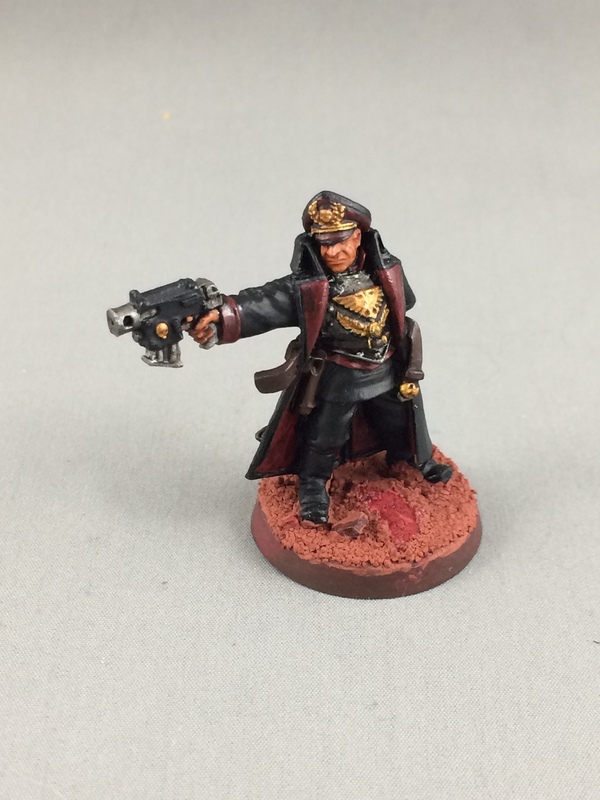 This was back in the Codex: Witch Hunter days when Imperial Guard could ally in to a Sisters army. 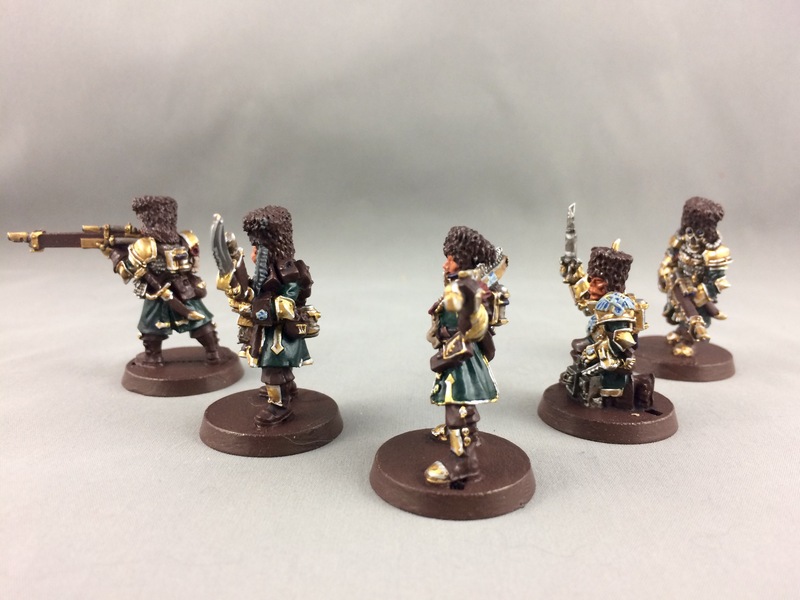 The Vostroyans aesthetically were a good compliment to the Sisters so I pulled the trigger on some models. They been sitting in boxes unpainted for years and Inner Circle seemed like a good time to pull some out. Especially with me picking a scene that specifically references the Vostroyans. 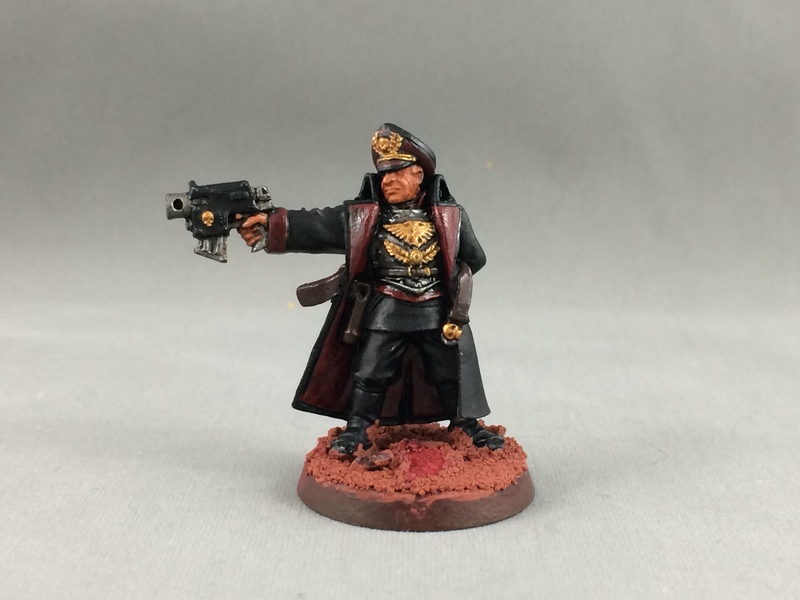 I went with all the traditional Vostroyan colours with the exception of the robes. 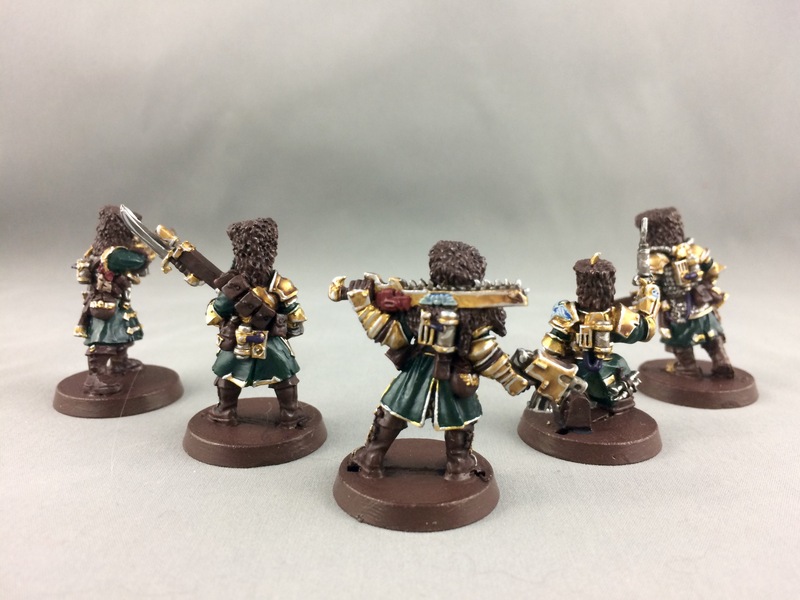 Back in the day when I purchased these fellows I designed my own fluff that matched by other two armies at the time- Sisters and Tyranids. My Tyranids are Hive Fleet Kodiak. I wanted to stay with the bear theme and named my system the Ursus System. 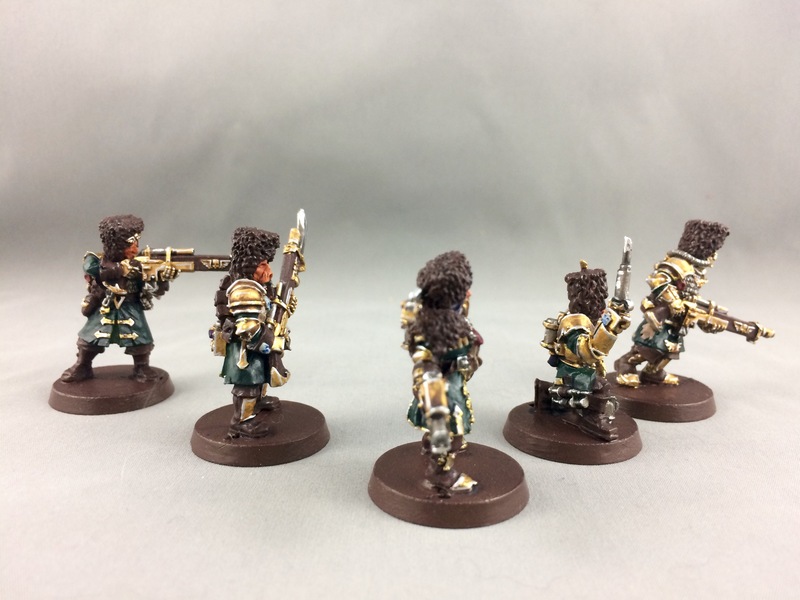 Hailing from Ursus Prime my Astra Militarum are aptly named the Ursons. My Hive Fleet was named Kodiak as it was first discovered in the Ursus System. I stayed with the Vostroyan studio colours with the robes being the exception. I saw green as a more earthy tone than red and I thought that suited the bear theme more. 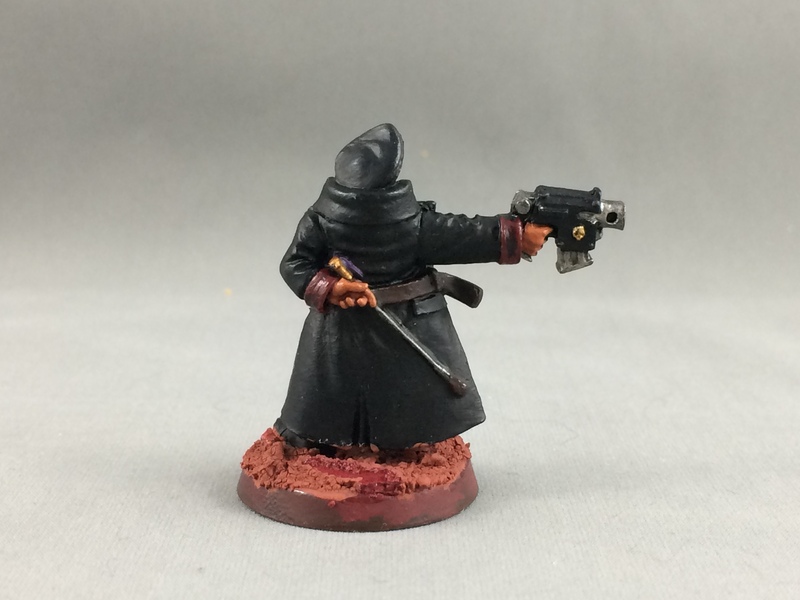 I entertained thoughts of painting the robes brown but I wanted the fur to be brown as well. I haven’t worked with green as a main colour yet so it seemed like the right thing to do. 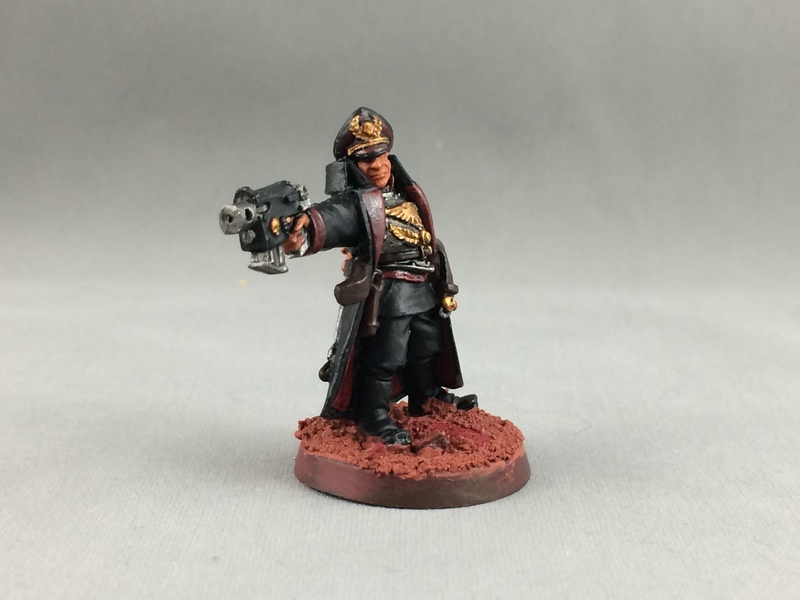 It would be a shame to have Astra Militarum pop out of Trazyn’s pokeball without a Commissar in tow. 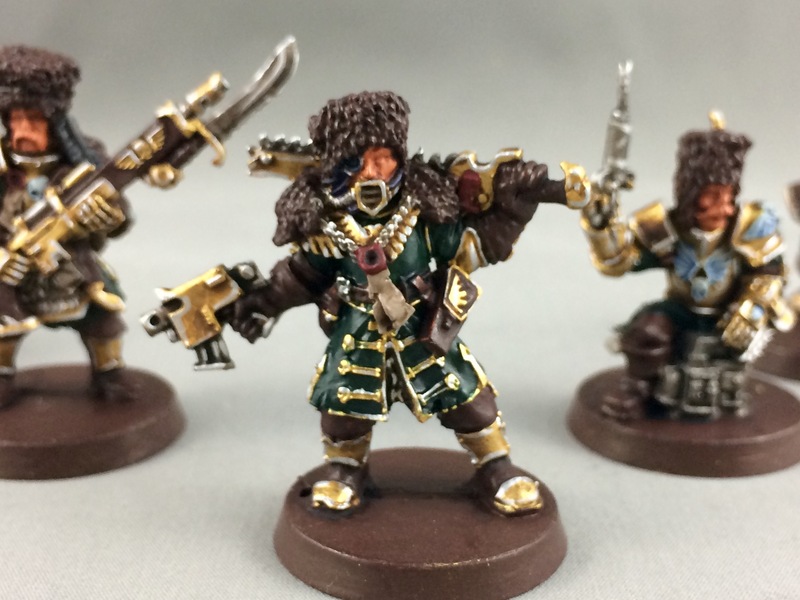 If I had more time I would have included more Vostroyan’s, however, it is easier to paint one model instead of ten. A character model is worth the same amount of points as a unit so I am going to take full advantage of that when time is of the essence. Plus the model looks badass too. 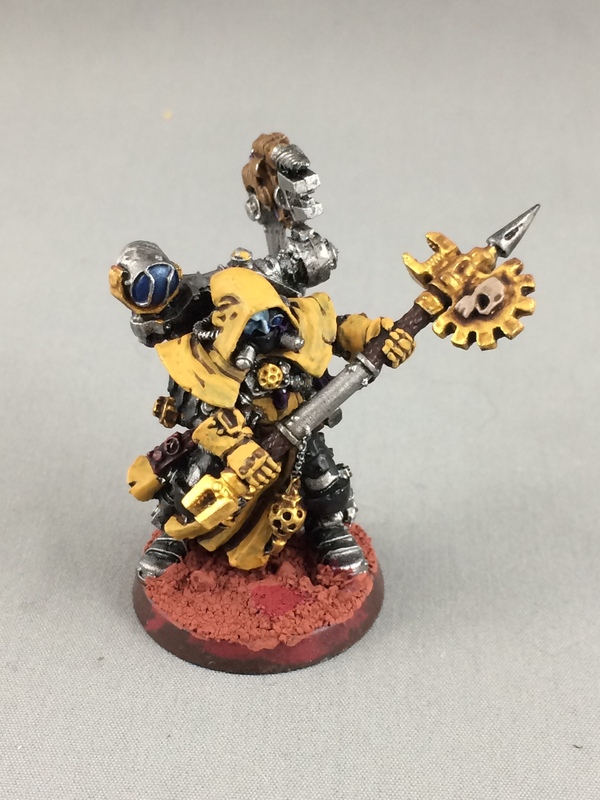 This was an easy model to paint the base colours. It was already primed black. 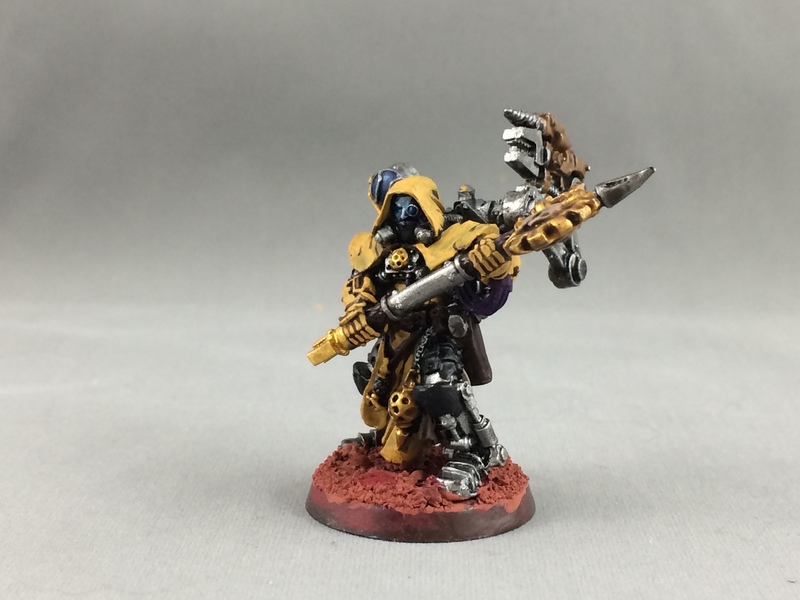 I painted the entire model black and then added colour to the details. The Techpriest Enginseer is a switch hitter. 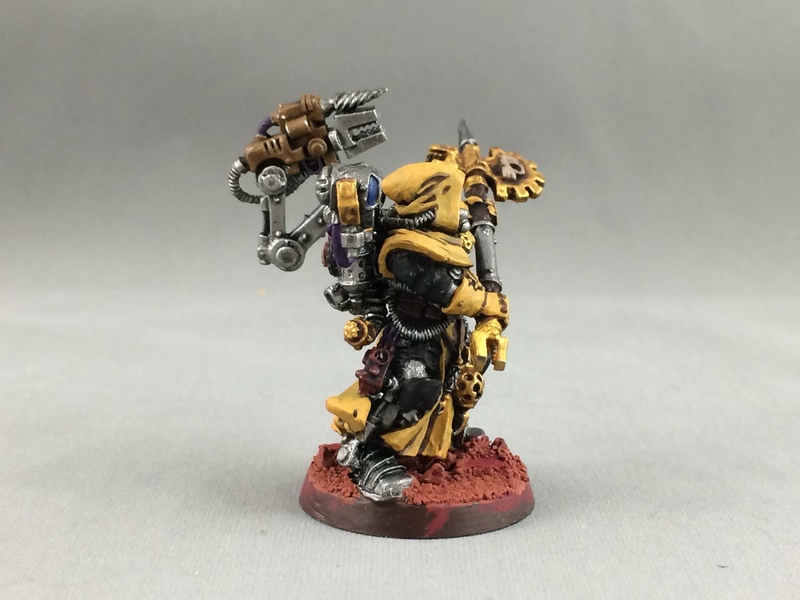 I categorized the model as Astra Militarum, but thanks to the soon to be defunct Codex: Imperial Agents the model also fits under the Adeptus Mechanicus line. 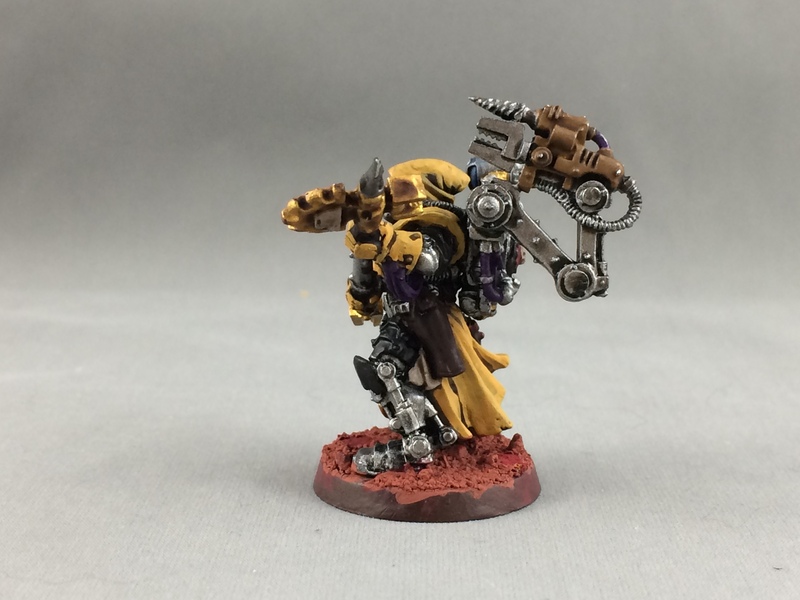 I chose to go with my Mechanicus colours. 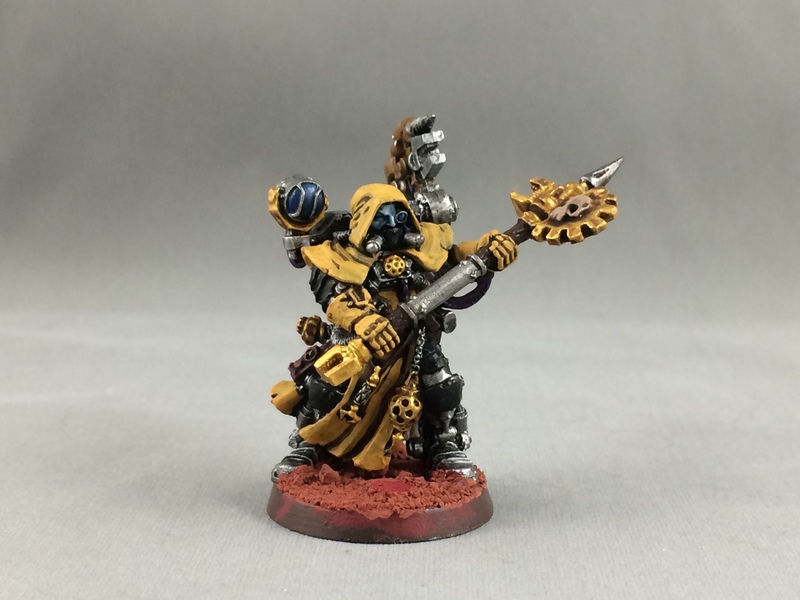 I added the Techpriest to the list to aid Belisarius Cawl trying to activate the Cadian Pylon. 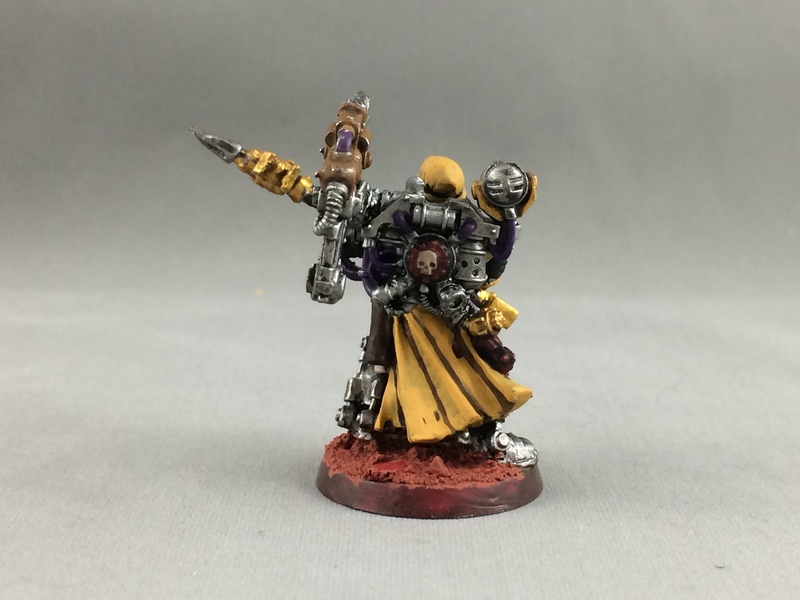 He also acts as security detail for Cawl while everyone else is preoccupied with the Black Legion. I have one beef with this model. I primed with black and sprayed Leadbelcher. Some of the paint I’ve applied over top the Leadbelcher rubs off when I am handling the model. It’s a nuisance so I put some ‘Ardcoat on and that seems to have done the trick. If you know of any other solutions please let me know. Inner Circle is almost upon us. I have to finish highlights on some Sisters of Battle and the Techpriest. Most of the bases have to be drybrushed as well as the display board (that’s easy thank goodness). My plan is to add some Cadian Guardsman bits on the bases, which will count as a conversion. Friday will be a late night. I have one more Inner Circle WIP post for tomorrow. That will be the Adepta Sororitas Retributors with heavy flamers. Really cool. I’ve never owned these minis but I’ve always liked them. How cool would it be if GW released plastic kits of these. The Iron guard, the Praetirians, Tallern etc all in plastic would be ace!!! Super awesome cool if they did. 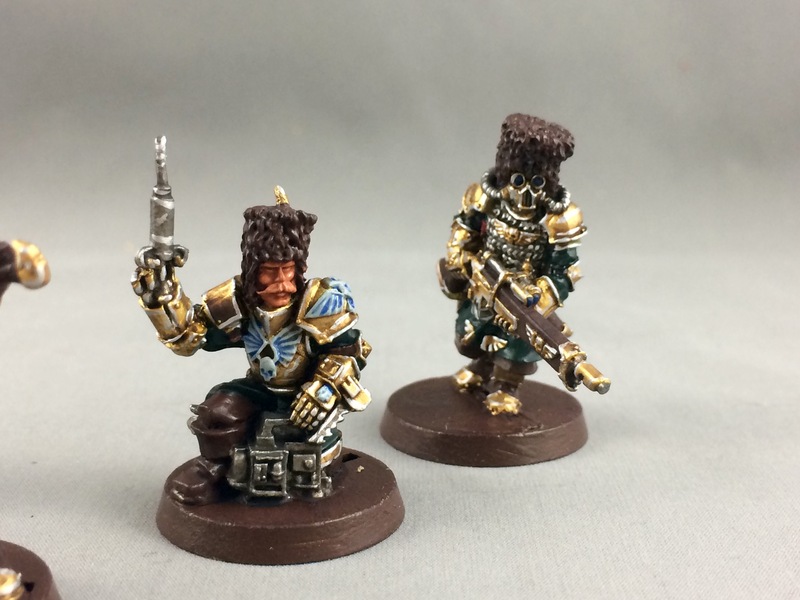 Those vostroyans are awesome models! Must say though, I would love to build a Praetorian guard army, but it would cost an absolute forturne! They are great models. Lots of detail on them. 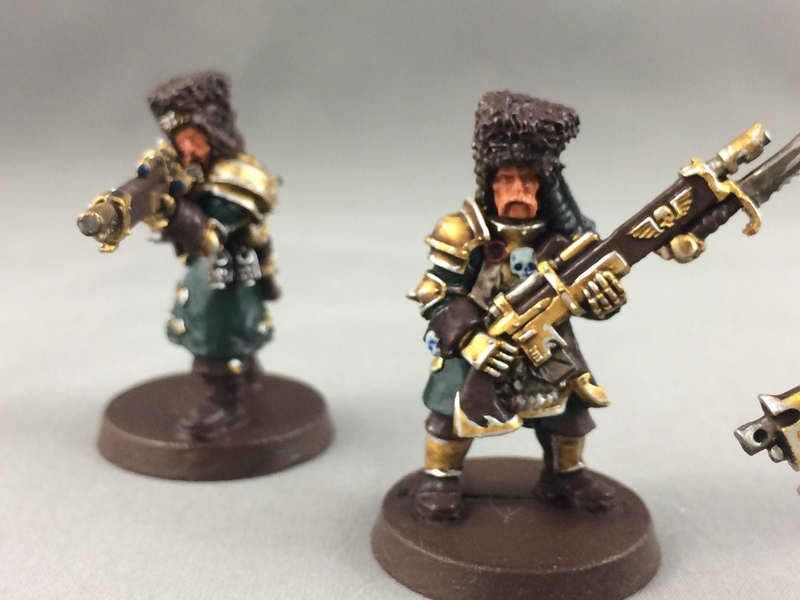 The best part about the Vostroyans is the moustaches. That was the part I enjoyed painting the most.